I thought it would be fun to make a set of sports themed cork boards for my sons room so he can pin up keepsakes, pictures, sports schedules and such. 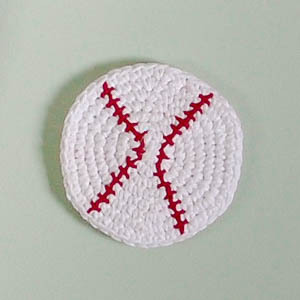 I started with this football cork board and just finished the crochet baseball one that I am sharing today. So far he is loving them! Round 5: Ch 1, work 2 sc in same st as join, 1 sc in each of the next 3 sts, *2 sc in next st, 1 sc in each of the next 3 sts, rep from * around, join — 30 sts. Round 6: Ch 1, work 2 sc in same st as join, 1 sc in each of the next 4 sts,*2 sc in next st, 1 sc in each of the next 4 sts, rep from * around, join — 36 sts. Round 7: Ch 1, work 2 sc in same st as join, 1 sc in each of the next 5 sts,*2 sc in next st, 1 sc in each of the next 5 sts, rep from * around, join — 42 sts. Round 8: Work 1 sc in same st as join and in each st around, join — 42 sts. 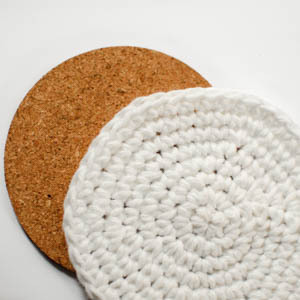 Check to make sure your crochet circle fits nicely over your cork disk, slightly wrapping over the edges. If it is too big or too small, you can eliminate or add one of the increasing rounds. Using red yarn and a yarn needle, embroider the finger grip detail as shown in the photos above.